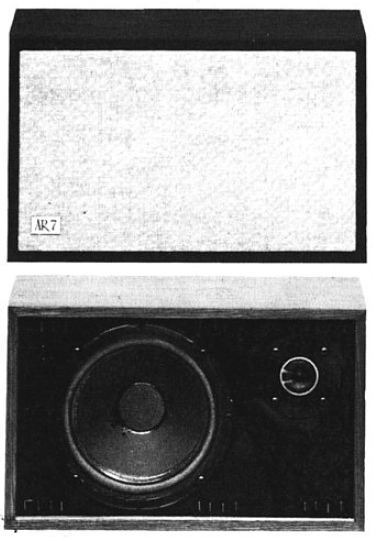 Acoustic Research described the AR-7 in its advertisements as nearly equivalent to the bigger, more expensive AR speakers. It was available in August 1973 for as little as $75 and therefor AR´s entry level spealer. Despite its entry level positioning, it gained significant attention and recognition from audio magazines at the time and has been described as an outstanding performer for its size and cost. The AR-7 is a surprisingly small, two-way bookshelf speaker. With less than 16 inch width, 10 inch height and a depth of 6 ¼ inch. The speaker is probably the smallest bookshelf speaker Acoustic Research had to offer during the mid 1970ies. It looks similar to all other Acoustic Research vintage speakers, but is significantly smaller. The speaker is equipped with an 8 inch acoustic suspension woofer and a 1 ¼ inch tweeter. Like most other AR-speakers it has a control to adjust the high frequency level. One AR-7 has a weight of only 11 lbs or 5 kg. The tweeter of the AR-7 is very similar to the one used in the AR-6. 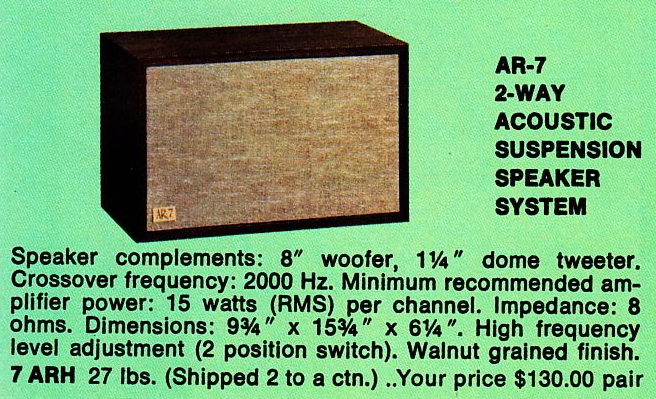 CBS lab tested the AR-7 in 1973 and was satisfied with its performance. The speaker had higher distortion at extreme volume, but was performing very well in all other tests. The sound of the AR-7 was described as clean and neutral, with ample transient "bite" but without "brashness," and with more apparent bass foundation than one might expect from such a small system. A realistic price for the AR-7 is very difficult to estimate as they became fairly rare. You can find them every now and then on ebay for about $200, but that is overpriced considering other AR speakers you can buy for nearly the same price. I have read of many occasions in which these speakers were sold for little money at garage sales, even for as little as $2! Realistically, I would assume that it is fair to pay up to $80 for these speakers. If the condition is good, a little more might still be ok. Be aware that refoaming these speakers can be quite difficult, but considering their age often necessary. It can be a hassle to detach the grills without scratching or damaging the veneer or grill cloth! Those are indeed very fine speakers! Own 2 sets and they sound much bigger than they really are. So if you love vintage audio, and you have limited space in your room, give these a try. You will be amazed what they can do. Very spot-on review! These speakers sound much larger than they let on and the bass response is phenomenal for something of this age! Can guarantee that I will not be selling these puppies anytime soon! I bought a set in 1973 when I lived in the UK. These were chosen over some rather more expensive and bigger loudspeakers available. Coupled with my Goodmans Module 90 receiver - they Seemed to me to be uncolored and good on many types of music and voice. Had the 8" reconed once when the suspension rings fell away but all good afterwards.